The Standard Street family is the entry point to the world of Royal Enfield’s cult motorcycling. The legendary Bullet range falls under this family. Its distinctive styling has remained largely unchanged over the years, but that is part of the bike’s charm. The bare-bones Bullet 350 is ideal for Royal Enfield enthusiasts who are under a strict budget. A slightly more premium model, the Bullet ES, features twin gas-charged shock absorbers, a front disc brake and an electric starter over the 350. This motorcycle will appeal to fans who do not want to compromise on modern features but still want an unmistakable ‘Bullet’. The range-topping Bullet 500 is apt for enthusiasts who want to have the go to match the show, all thanks to the torquey 499cc, single-cylinder, twin-spark engine. 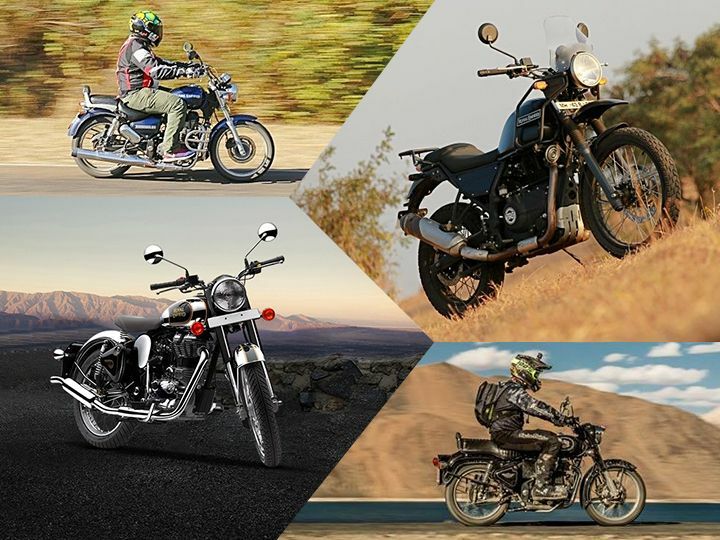 Nothing comes close to the Classic range from the Retro Street family when it comes to proper vintage-style motorcycles with a quintessential British charm while being affordable for a majority of Indian two-wheeler buyers. This is one of the reasons why it single-handedly became the highest-selling model from the brand’s stable. This motorcycle comes in two engine variants with multiple colour choices. The Classic 350 is apt for budget-conscious riders who want a distinct old-school pizzaz in their motorcycle. However, if you crave for more torque and are not worried about the relatively higher fuel bills than the 350, go for the Classic 500 instead. It also offers the advantage of fuel injection, which helps in providing crisper throttle response and easier cold-starts. The Classic 500 Pegasus is a limited edition variant of the regular model. While the differences are mostly visual, it offers unparalleled exclusivity, rich with the brand’s history connected to the legendary ‘Flying Flea’ that made a name for itself during World War II. You can read all about the story of the Pegasus Edition here. Royal Enfields are synonymous with laid-back highway riding. The Thunderbird family is arguably one of the most feature-laden motorcycles from the British brand. Both the 350cc and 500cc variants feature dual trip meters with average speed readout, digital fuel gauge, a generous 20-litre fuel tank, projector headlamp with LED DRL, and relaxed ergonomics. Though the Thunderbird 350 feels short on power on the highways, it is still a good choice for enthusiasts who love to go on long rides, thanks to its comfortable riding position. However, the mini ape hangers take some time to get used to in the city. The additional power and torque of the Thunderbird 500 is useful when traversing through the serpentine ghats or overtaking trucks. The Thunderbird X range is targeted at urban-centric riders who want a snazzy but capable cruiser. The brightly-coloured fuel tank, colour-matched rim stickers and modern alloy wheels make it look a bit more hipster than the rest. It also gets slightly sportier ergonomics thanks to the flat handlebar. With the Himalayan, Royal Enfield really went beyond their area of expertise to cater to the needs of riders who like to explore the unknown. Its spartan design is meant to be as functional as possible, while the modern 411cc, air-cooled engine with oil-cooler is the most refined among Royal Enfield’s motorcycles. At Rs 1.56 lakh (ex-showroom Delhi), the Himalayan is the most affordable adventure tourer available in the country at present. No-nonsense adventure enthusiasts will find the Himalayan appealing as it is the only off-road friendly motorcycle in the lower end of the spectrum.